By Dennis W. Viau; modified from a restaurant trade journal. Bolognese is a ragù, or chunky sauce. 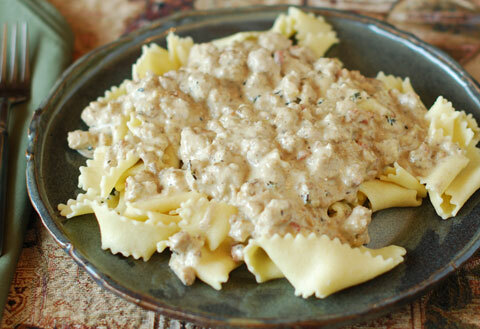 The sauce gets its “white” name from using heavy cream rather than a tomato sauce for the base. There is room for variation here, such as using different meats (see the ingredients for suggestions) and choosing whether or not to process the sauce to a smooth texture before serving. Even the pasta can be substituted. I think penne pasta would work well. In a medium-large skillet, sauté the pancetta on medium heat to render the fat, 3 to 4 minutes. Add the garlic, shallot and thyme. Stirring occasionally, cook until the shallot is translucent and tender, 3 to 4 minutes. Add the wine to deglaze the pan, scraping the bottom of the pan. Simmer to reduce the liquid volume by about half. Add the ground meat, breaking it up with a spoon. Cook until all the meat changes color (it doesn’t look raw). Add the cream and stir. Add the (optional) red pepper flakes. Season with salt to taste, then reduce the heat to medium low. Cook for 10 minutes, stirring occasionally. Add chicken liver puree and simmer for an additional 10 minutes. Check for moisture. If the sauce appears to be too dry or thick, it can be thinned with a little extra cream or milk. For a smoother sauce, transfer the mixture to a blender and pulse to the desired texture. For a chunky texture, do not use the blender. Adjust seasoning to taste. Plate cooked pasta (cooked according to package directions) and drape with sauce. Serve with your favorite vegetables or a side salad.